The head sits on seven bones of the neck, perfectly balanced like a ball on a stick. 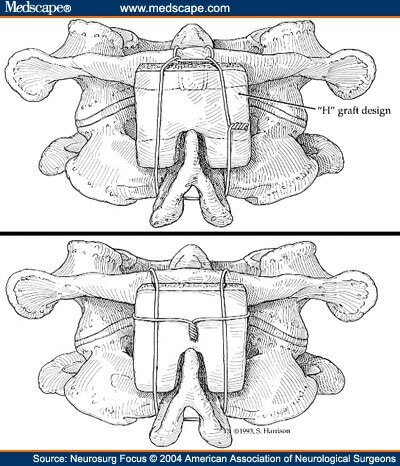 Three of these cervical vertebrae are quite different from the others in shape and in function – the seventh on which the others perch and the first and second upon which the head sits. Whole books have been written about the ‘craniocervical junction’ and some neurosurgical authorities make their names and reputations in it. I enjoy craniocervical surgery and often think it and intradural surgeries are two of the operations that fall more into the repertoires of complex spinal neurosurgeons (versus complex spinal orthopaedic surgeons). 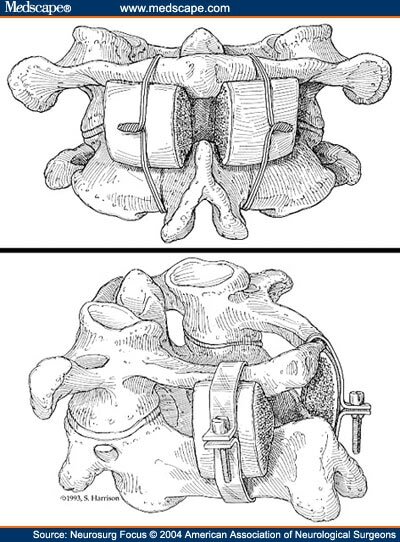 The atlas (C1) rotates on the peg of the axis (C2) and the head flexes and extends on the atlas, all of these structures being attached by several short, strong ligaments and muscles. In a variety of conditions from trauma, infection, cancer, abnormal development to rheumatoid arthritis (much more rare in the last decade with modern advances in disease modifying drugs), these bones or their attachments can become broken or deranged, necessitating fixation. The neck can be ‘fixed’ simply by wearing a hard collar for a couple of months, but it does not always fix in the right position and the bones may not always unite in the correct orientation. An alternative is fitting of a halo jacket which uses four pins in the skull and a tight fitting mould over the shoulders and chest to keep the neck rigid. It can be uncomfortable, difficult to bathe in and, for some, difficult to breathe easily in. 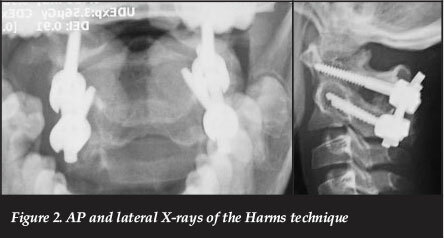 I have seen the best results from halos in children, rather than the elderly who more commonly fracture cervical vertebrae. There are several operations that can fix C1 to C2, should their connections be disrupted by breaking part of the odontoid peg of C2 or the ring of C1 for example. In some circumstances a ‘peg screw’ placed through the front of the neck can pull it down and into alignment and fix it in place. 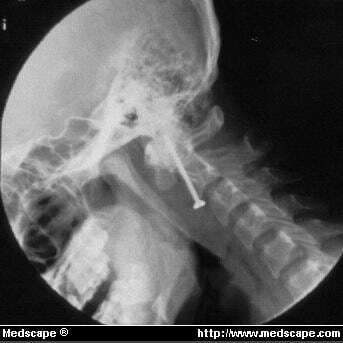 More commonly, the fracture is such that surgery from the back of the neck is indicated. I contributed most of the patient data to this case series, operated on by one of my complex spinal surgery mentors, Mr. Tom Cadoux-Hudson. 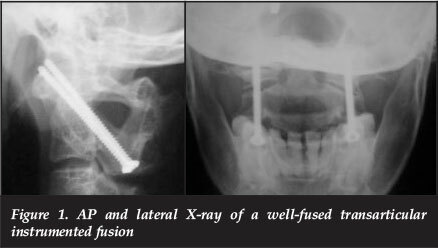 I was proud to publish the results in an Indian journal, firstly because the operation was first described by an Indian neurosurgeon who has made his name in the craniocervical junction, Prof. Atul Goel of Mumbai whom I once met in Kuala Lumpur in 2010 and who was most cordial in encouraging me to visit and see how he operated. Secondly because around that time, I published a case report on the same operation to treat a particular type of infection by the spine grandly called La Maladie de Grisel, and had a slightly heated correspondence with him about the origins and nuances of his ‘double insurance’ operation. Finally, the paper was a career defining one for my contemporary at Oxford University Hospitals, Mr. Murtuza Sikander, who also trained in India and was recently able to establish himself at Oxford after its publication. The early Goel method which we describe in the paper. Magerl’s method of just passing a long screw through the joint between C1 and C2. Harms’ method of passing C1 lateral mass and C2 pars screws and joining them with rods on each side. This is most surgeons’ (including my) preferred method as it is very strong with less risk of vertebral artery injury than the above two methods. All of this illustrates that there are many ways to skin a cat, even (especially?) in neurosurgery and complex spinal surgery and that one should choose an experienced surgeon exposed to most if not all of these methods and comfortable with at least one which they choose for good clinical and scientific reasons, not just because that’s the one they were taught. With more experience, I now perform a different operation (Harms) to the one I was first taught (early Goel) as I think to all practical purposes it is just as strong, but less risky and less difficult to do well. Neurosurgeons shouldn’t do the most difficult operation they can just because they think they can. It comes back to the Hippocratic aphorism that entitles the recent bestseller of my St George’s consultant neurosurgeon colleague whose many stories from the neurosurgical frontline I thoroughly enjoy listening to, Mr. Henry Marsh. Do no harm.